Hello! Clean and Simple is not my normal style, and I know I probably didn't do it justice, but I had this idea in my head for this darling Hero Arts Clear Set called Sending Holiday Cheer. Aren't these Christmas houses just so cute?! I stamped the images onto Kraft cs with Memento Rich Cocoa Ink. I colored just a few areas with Copics and added some Stickles to the ice and snow. The sentiment comes with this set, and the snow drifts were made with PTI dies. You can find all the highlighted products at the ABC Toys and Crafts Store where everything is marked 10% off MSRP and Clear Stamps Sets priced $12.00 or more ship FREE! This is awesome! Love the simple look of it and the glitter is such a great touch. Beautiful card Kerri. I love the craftpaper. Wow your card is absolutely fantastic! You really know how to make paper and ink shine! 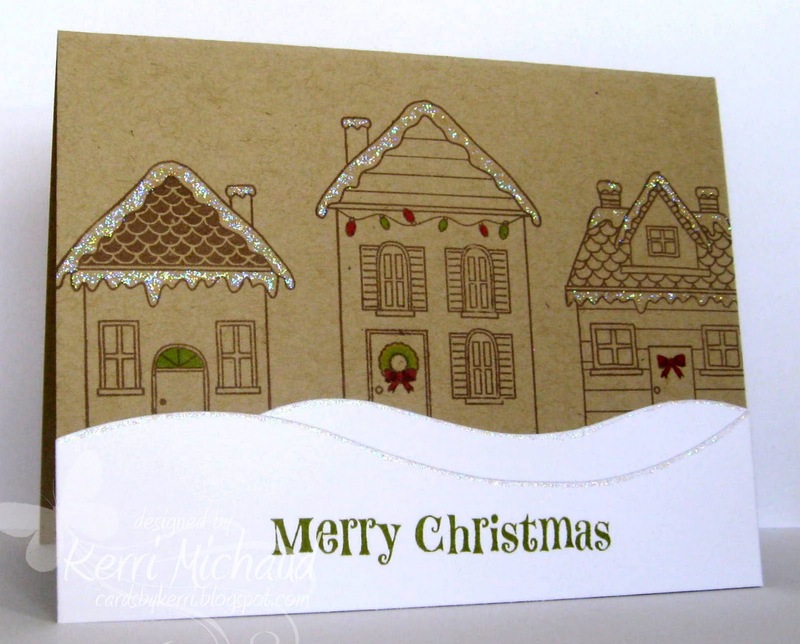 I love this, Kerri...the little houses on the kraft are just tooo cute and I love how you created the snow!!!! !